Ever since MPL came out and its success, many apps have tried to follow its footsteps. The one I recently reviewed was GameChamp which comes from the company that owns Qureka. But I never expected an existing app to do it. 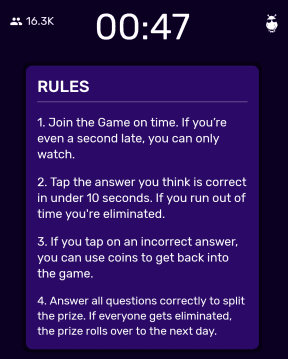 Loco that used to be a live-quiz app now lets you earn more money by playing games and participating in “predictor quiz”. You can enter the Loco Arena and earn cash by playing games. There are over 12 games to choose from. There are two types of game tournaments- 1. Free and 2. Paid. Free tournaments are free to play and you can win coins or cash. To join paid tournaments you need coins. You can earn coins by sharing your referral code and referring your friends to Loco app. You can also practice the games to hone your skills. You can also win cash prizes by participating in League Games(a type of prediction game). You need to pay some entry fee(coins) to join the sports predictor quiz. You will be asked questions about the match for which you join the quiz. The questions will be about what you think will happen in the match. There are 10 questions. Some of these have options while others require you to enter a specific number. For the questions with options, you get some coins on getting it right and 0 on getting it wrong. The number of coins at stake will be mentioned for each question. You will be ranked on the total number of coins won, based on how many answers you get right. Results will be announced after the match is over. They introduced a few new games but they still hold on to this. You can still win cash prizes and coins by play live trivia quiz at 9 PM every day. You can earn 1,540 coins for every new user that enters your referral code. You can withdraw your earnings to Paytm or Mobikwik wallet. Minimum redeemable amount: Rs. 1. Loco is a great app to earn some extra cash by playing games and quizzes. It’s all fun and games and you don’t have to spend anything. It's available on Play store and Apple app store(India).